“HUMAN NEEDS ARE UNLIMITED” – The most famous line or the one which can be considered as an opening line for any economic theory. According to the evolution theory, earlier man used to live in lap of the nature using the things provided by it. When his brain started thinking and discovering new things, he tried to live more comfortably. As we know desires are unlimited and transition is inevitable, humans started thinking about luxuries not satisfying with comfort. Corruption- may be one such idea born from that thinking. These days every individual tries to lure others in order to get their things done without bothering about its consequences on others. 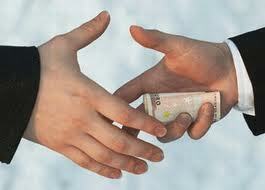 The recent times of India made corruption the most discussed topic among its citizens irrespective of age. The coal scam remains as the best example for corruption in India. The CAG (Comptroller and Auditor General) reports indicate that this scandal caused a loss of 1.86 lakh crore to the government treasury. This pushed the 2G-scam into 2nd place which caused a loss of 1.76 lakh crore to the treasury. As our honorable minister of home affairs said that the people of India forget scams, these scams erased CWG scam (Common wealth games) which caused a loss of 80,000 crore (i.e. 0.8 lakh crore) from the memoirs of common citizens. With an intention to project our nation’s capability to world and to compete with our neighboring country China India decided to organize Common Wealth Games. Even though India secured 2nd position with 101 medals the events like collapse of bridge and unhygienic conditions in sports village depicted the redtapism and corruption levels in India. As per the recent corruption index, India ranked at 75th position (one being the most corrupt). Other emerging economies like China and Brazil ranked at 65th and 63rd respectively. If this is the case of India, corruption is prevalent in other nations also. For example if we consider US, Wiki-leaks, an espionage organization couldn’t have procured all those confidential audio tapes and files without corrupting the officials/citizens of America. If we consider China, several Chinese industrialists said they will not compete in the bids in which sons of CPC (Communist Party of China) members participated, which nothing but partiality to a certain section of people. Coming back to the case of India, even though the government of India defending itself saying that their government have been implementing the policies introduced by the opposition party when they were in ruling. This cannot be accepted because people of India voted for them expecting a change not only for namesake but also for introducing transparence in governance. We cannot call opposition the better choice because when the current government tried to introduce competitive bidding in coal block allocation, the opposition ruled states opposed the scheme. All these aspects are tarnishing the country’s image on international arena, weakening the confidence of foreign industrialists and preventing them to invest in India. As a citizen of India it is our responsibility to protect country’s reputation. As the quote goes “an apple doesn’t fall far from the tree”, we can’t expect our politicians to be perfect, we being imperfect. For example we need stop petty things like bribing traffic police for not having license or for not wearing a helmet. We shouldn’t try to bribe the government officials for procuring information. Let us hope for a corruption free world.